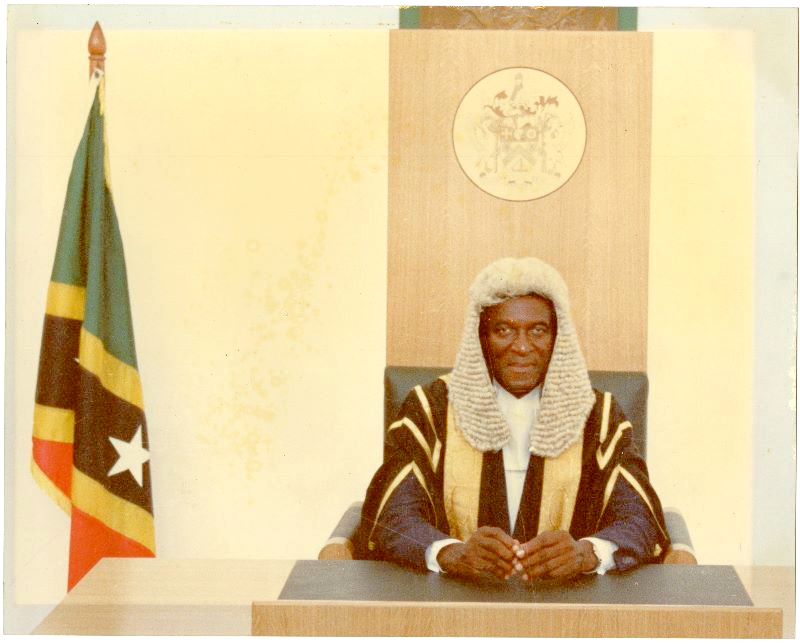 BASSETERRE, St. Kitts — Former Speaker of the St. Kitts and Nevis National Assembly, Honourable Ivan Charles Buchanan, CBE, JP, (January 28, 1921-January 14, 2019), has passed away at the age of 97. Hon Buchanan was Speaker of the National Assembly for 10 years (February 6, 1985 to 1995) under the Dr. Kennedy Simmonds People’s Action Movement (PAM) Administration and one of the earliest Speakers in a Post-Independence St. Kitts and Nevis. Hon Buchanan was born in Sandy Point, St. Kitts, on January 28, 1921, to Joseph and Susannah (Fox) Buchanan. He married twice and is survived by his wife of more than four decades, Mrs. Beatrice Buchanan, and children. Hon Buchanan led a remarkable life of service to his country, both in the public and private sector. He received teacher training at the Education Department in St. Kitts from 1939-1941; received a diploma in Public Health from the School of Public Health in Jamaica in 1954; and postgraduate qualification from the University of Minnesota, in the United States, from 1959-1960. As a civil servant for 27 years, Hon Buchanan taught as a primary school teacher for a few years and later as Chief Public Health Inspector (1949-1971) at the time of the MV Christena tragic disaster. He also served in the Turks and Caicos Islands for several years as a public health official. Hon Buchanan served with several companies, including as a business manager/consultant for the Trading and Development Corporation (TDC); Director and Vice Chairman of the Board of Directors for the St. Kitts Nevis Anguilla National Bank; Director in the Cable Television Company; and Director in National Caribbean Insurance Company. Hon Buchanan received several awards for his sterling service to nation building including War Service Medal from Her Majesty’s Government in 1945; Commander of the British Empire in 1992; and Health and Community Service Award from the Government of St. Kitts and Nevis in 1983. Prime Minister Dr. the Honourable Timothy Harris extends his heartfelt condolences, and those of the Government and people of St. Kitts and Nevis, to the family and loved ones of Hon Buchanan. “Ivan Buchanan CBE, JP made an indelible imprint on the fabric of our country, rendering outstanding service that spanned more than half a century,” the Prime Minister of St. Kitts and Nevis said. Prime Minister Harris extended his deepest sympathy to Mrs. Beatrice Buchanan, his wife of over 40 years, and children.